What mysteries lie beneath that ancient sea? What treasures are just waiting to be discovered? 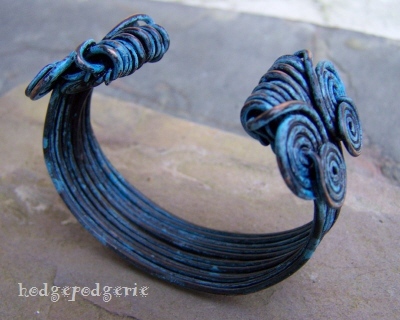 Looking like a relic from the deep, this modern version of an ancient bracelet design is as wearable today as it was thousands of years ago. 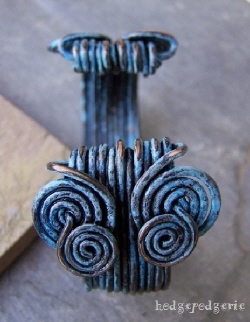 In the ancient Greek style and reminiscent of an Ionic column, this cuff style bangle is made of pure copper wire and then 'aged' with a vivid turquoise patina that mirrors the intense blue hues of the Aegean Sea. 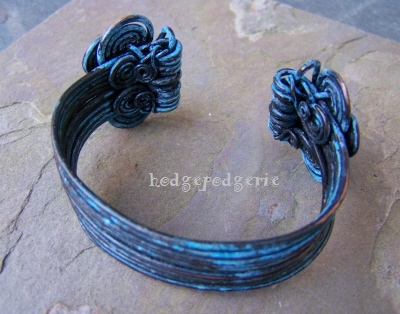 The bracelet is coated in a clear protective lacquer to help preserve its finish. 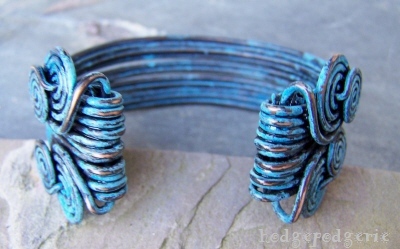 This cuff can be made to fit up to a 7 inch wrist. It is 22mm (approx. 3/4 inches) wide in the back. The swirls on the top are 35 mm (approx. 1-1/2 inches) across. And it is solid, weighing 1.8 ounces! 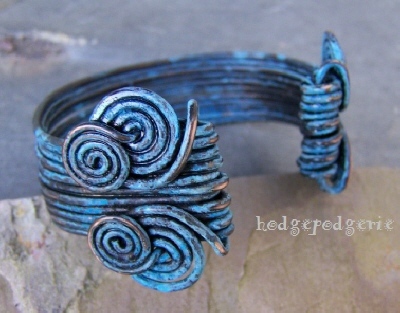 Return from "Aegean Copper Cuff Bracelet" page to "Bracelet Gallery" page.